Laura Mui tosses in her bed fitfully. She’s so upset that she gives up trying to sleep. Next to her, in a deep slumber, is her partner, Christopher, who’s become an unwitting symbol of workplace inequity. She isn’t naive. She knows that sexism and racism exist in the world, but the blatantly discriminatory salary she had been offered for a job she had worked as hard as any male to attain is like a slap across the face. To distract herself, Mui turns on the lamp light, sits up in bed, and turns on her laptop. Scanning her Facebook feed, she coincidentally stumbles upon the page for MomsRising, a grassroots advocacy group for women and families. The group has put out a call for personal essays about the gender wage gap. Do I ever have the perfect story for you, she thinks. Her fingers banging the keyboard, her essay comes out in an inspired, angry burst. The anger doesn’t surprise Linda Babcock, a nationally known expert on the gender pay gap. The economist and professor works at Carnegie Mellon University, which is based in Pittsburgh and has an impressive history in the arts, business, engineering, humanities, science, public policy, and technology. As for Babcock—who is the head of the Department of Social and Decision and Sciences in CMU’s Dietrich College—she studies why women such as Mui often earn less than men. Mui’s story about the job she accepted in 2007 was such a blatant case of gender wage discrimination that she testified in 2013 at a House Democratic steering and policy committee meeting led by Rep. Nancy Pelosi. Her testimony describes the $35,700 job offer she received as a therapist at her former elementary school in Oakland, Calif. Her partner, Christopher, working the same job, was making $41,000—that’s nearly 15% more. Her partner made the higher salary, despite the fact that they have identical master’s degrees from Columbia University. “When we became employed by the same agency for the EXACT same position (just at different school sites), we were both dumbfounded by our salary offers,” she writes. In fact, they both thought Mui would land a bigger salary because of the five years of mental health experience listed on her resume and excellent recommendations, qualifications he lacked. The only difference: She’s female and Chinese. He’s male and white. At one point, as she types at a pace that builds with her anger, Christopher wakes up and asks what she is doing. She tells him she is writing about the inequitable salaries, and he encourages her to go for it. He’s upset on her behalf. He knows the salary disparity is utterly unfair. Mui appreciates his support, but it doesn’t make it any less depressing for the social worker who has worked hard her entire life, balancing multiple jobs with the heavy workload at elite schools. She has complained about the salary discrepancy to the social service agency, but they have told her to take the job or they will give it to someone else. Saddled with bills and $80,000 in college debt, she takes the job. The disparity is as much of a problem now as it was then. After a narrowing of the gender gap in the ’80s and ’90s, the median income for women working full-time has been stuck at about 79 cents for every dollar made by men. The gender pay gap is debated on the presidential campaign trail, in corporate offices, and in tech startup board rooms. It’s a hot issue in the glamorous world of Hollywood, where Jennifer Lawrence has been complaining that female actors get paid less than male actors. Often, the bias is not a glaring example like Mui’s because the salary numbers are shrouded in secrecy. After all, most people aren’t working the same job as their significant others and can’t compare pay stubs. “Her case is awful,” says Babcock, who is also the James M. Walton Professor of Economics at CMU’s Heinz College. “It’s such a clear-cut case and an extreme example” of the pay gap. Babcock’s research is at the intersection of economics and psychology, and her expertise on the subtle factors that can hold women back at work have made her an authority on the subject. She has been quoted in publications ranging from The New York Times to The Wall Street Journal to The Economist and has appeared on broadcasts ranging from NPR to CNN. She says women often hold back from negotiating in the first place because they fear backlash. She came to this realization 20 years ago when she was serving as director of the doctorate program at CMU’s Heinz College, renowned for everything from public policy to information systems. One day, a group of the female graduate students came into her office and complained that the program was sexist. “What do you mean?” she asked, dumbfounded. They told her that male graduate students had all the higher-paying instruction jobs whereas the women were relegated to the lower-paying teaching assistant positions. When Babcock asked the dean why, he explained that the men had come into his office and asked for the instructor jobs because they were about to enter the job market. It was only then that he realized that none of the female grad students had asked to teach a course. Babcock went back to the female students, and they told her that they assumed the way that the world operated is that someone would send out an email that says, “Who wants to teach?” It hadn’t even occurred to them to ask. “So it just got my research hat thinking, and that is how I started studying this phenomenon of women not negotiating.” That experience also taught her that the gender pay gap is often not intentional. From that point on, the economist began studying the gender divide. The book she co-authored, Women Don’t Ask: The High Cost of Avoiding Negotiation and Positive Strategies for Change (Princeton University Press, 2003), was so influential that Fortune Magazine named it as one of the 75 smartest business books of all time. The book also was a Finalist for the Independent Publisher Book Awards. In the book, Babcock argues that avoiding negotiation has a high cost for women. “Research shows that society has strong preferences about the manner in which women negotiate,” she says. That is why she started the Carnegie Mellon Leadership and Negotiating Academy for Women, where women across the country are trained how to negotiate for things large and small. A woman from the academy walks into a gas station and asks for discount on the price of gas listed on the pump. The cashier gives her a baffled look. No, the price is $1.89 a gallon and, uh, no, she can’t get it cheaper. But he hands her a free bag of chips. Negotiating for less-expensive gasoline might sound like an exercise in futility, but the academy at least gets participants in the habit of asking for things. The six-month program meets two days per month to train a group of about 25 women on negotiation, leadership, branding, etc., and to provide individual coaching to help them implement their skills. Babcock started the academy to train women how to negotiate in a way that won’t backfire. Women often get shortchanged at work because men negotiate for a higher salary and other benefits four times as often as women. Each month, academy participants are asked to negotiate for something that has progressively greater consequences. First, the women in the academy warm up their negotiation skills by asking for something they don’t care about or don’t expect to receive. Some of the braver souls complete this assignment by going into a gas station and making the preposterous request of a discount on gas. “It’s a silly thing,” says Leanne Meyer, program director for the academy. “We ask women to have fun with it.” None of the participants has ever received cheaper gas, but many bagged free snacks. As the program progresses, women ask for things that matter more, such as a raise or promotion. They are coached on how to ask for things without suffering backlash. 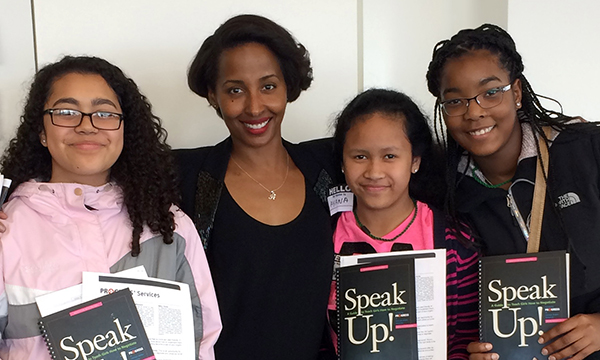 Ayana Ledford, Founding Executive Director of PROGRESS, with some future professional women at a half-day workshop in Arlington, Va.
Women are being held back because they are often assigned to the “committee work” that benefits the greater good of the organization but does not get them promotions or higher salaries. So she teaches them to negotiate for roles that will give them better visibility and more money. The participants have experienced many successes, including salary increases, an extra week of vacation, or more resources for their departments. The academy has attracted participants from around the country, and for the next session, Meyer is talking to women from the Ivory Coast and Spain. “We are also talking to multinational companies that are interested in running the full academy in-house,” Meyer said. Babcock doesn’t just train mid-level career women on how to negotiate effectively. She also teaches females much younger—ages 8 to 13—through the Program for Research and Outreach on Gender Equity in Society (PROGRESS). The girls aren’t usually negotiating salary, but they learn skills for conflict resolution in their day-to-day lives. Case in point: Two best friends buy the same prom dress and can’t return them. What can they do? Instead of getting into a fight and never talking to each other again, they learn how to negotiate a solution. One girl might dye her dress or shorten it. PROGRESS also coaches girls how to untangle the hard feelings that can erupt on social media. A teenager’s friend talks about her on social media. How should she respond? Instead of saying something bad about her friend and escalating the drama, she might talk to her about any underlying misunderstanding. PROGRESS has expanded outside Pittsburgh as it trains about 500 girls a year. For example, in partnership with Deloitte Consulting, it hosted a half-day workshop in Arlington, Va., for 100 girls this year. Using a train-the-trainer model, PROGRESS workshops were also held in San Francisco, Boston, Colorado, and Maryland. Aside from empowering women to be better negotiators in their own lives, Babcock also weighs in on the national debates surrounding company strategies aiming to narrow the wage gap. For example, the company Reddit is trying a no-negotiation policy. Other companies are also experimenting with salary transparency so women will know whether they are being shortchanged—a feeling Mui knows only too well. Every two weeks, Mui and her partner would get their paychecks, and it was like a ding in her brain—a reminder that she was valued less than her partner, setting off a new wave of resentment. She loved working with the kids and staff at her former elementary school, but her salary made her doubt herself. She also struggled with the irony that the gender and race issues she helped students work through had affected her own self-worth. The couple, now married, worked through their problems. But the effect of the lower salary lived on for her. When interviewing for her next job, Mui negotiated her salary from a lower level.